Welcome to the WDAS monthly newsletter for September 2018: a digest of the month's latest contributions to our website. 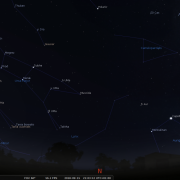 Below you'll find Society News, Sky Notes, all about the August events: Regatta solar parties and Folk Week star parties, as well as coming events. 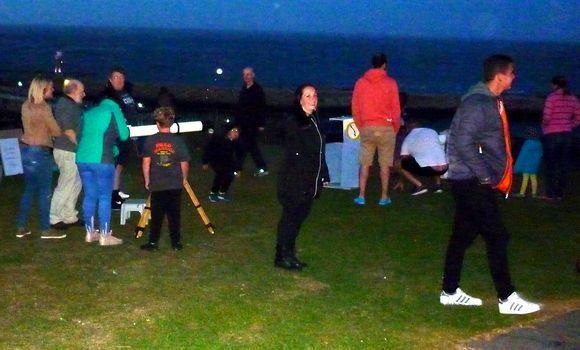 On paper the prospects for this year’s Perseid shower were on the face of it as good as it gets for our society: no moonlight to interfere, a summer of seemingly endless clear nights, and for us the timing was perfect for the Regatta star parties. 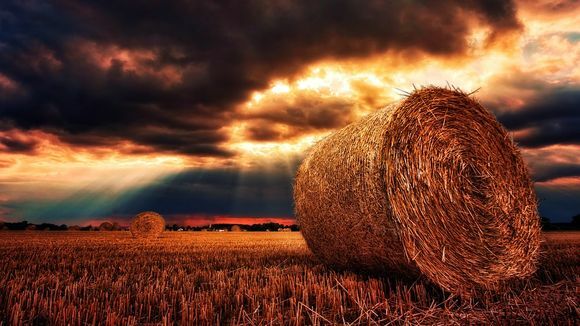 Well, on paper many things look great, but when events depend on the weather, never count on anything. Actually late Friday / early Saturday morning, skies were crystal clear, and anyone looking out in the wee hours would have spotted some Perseids, as Mark did. From the fairly short period spent watching, and from a restricted viewing aspect, the Plough/Ursa Major region, four were spotted in 20 minutes, corresponding to estimated zenith hourly rates of perhaps 25-35, not bad for a pre-peak date. 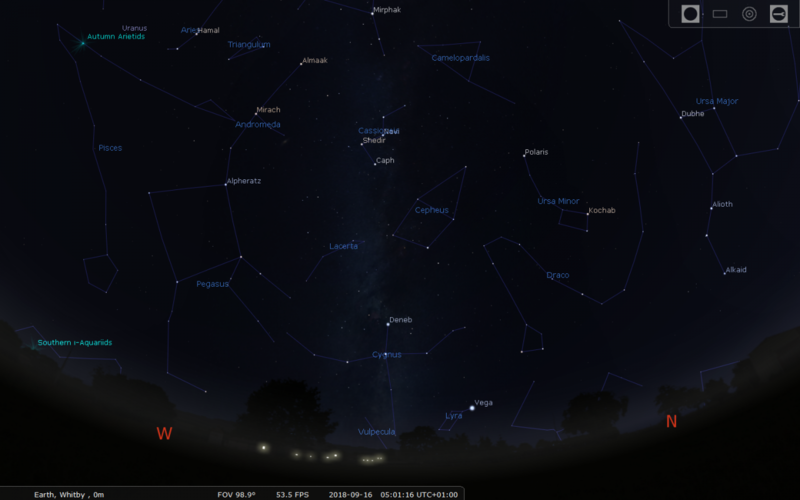 Then the weather intervened and both Saturday and Sunday nights turned cloudy with rain, not even a sniff of a Perseid! Well it was regatta! On paper this article will be a great deal shorter than last year’s, the weather over the Regatta weekend preventing any War and Peace length article. So here is a précis of events. Saturday, probably the best day, did allow some observations of the sun at the solar party event. As usual now our location was adjacent to trampoline/Go carts on the West Cliff and near to our friend Marcus at Grover Optics and the bird of prey display. The new gazebo acquired last year went up like a dream and once all the poster boards, inflatable solar system and scopes were set out, our pitch looked half decent- bordering pretty good. Andy L, Keith and Lee, all came along to help out, it was then a case of waiting for the sun to appear, which it duly did. Déjà vu... again, just like at Park Fest the Sun was completely blemish free, indeed it may have been for well over a month. 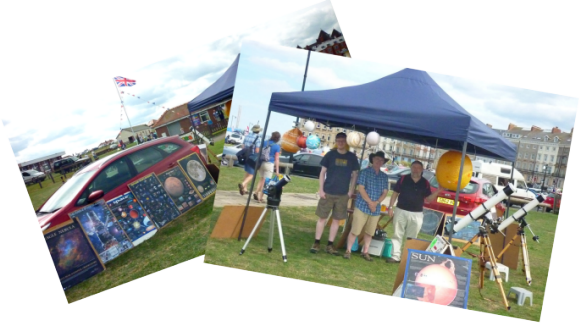 Still, the afternoon wasn’t wasted with quite a few members of the public coming across to have a look, ask questions or enquire about the planned star party events. Well, the planned star party events were disappointing to say the least, heavy cloud cover and the threat of rain, prevented any observations. On Saturday night, Keith, John L and Mark did turn up, looked up at the sky, chatted a short while to the very few, extremely optimistic members of the public who came along, and then departed. The Sunday afternoon solar event went ahead, but with a reduced set up – based in and around Mark’s car. Little of the sun was seen. The evening event was a solo affair, just Mark, no one else, a threatening, cloudy sky and for just a few brief minutes, Jupiter- in a tiny clear slot. Mark unloaded the 6”dobby, carted it across the number 4 pitch hole, set it up, acquired Jupiter, then the clouds rolled across accompanied by a splashes of rain, so he carted it all back again, went home and sulked. When you are looking for decent weather on a set date, a definite pattern is developing; can you see what it is? Keith and Mark did venture up to assist Marcus on the Monday afternoon, trying out a little solar viewing with an 8” Celestron and solar filter Marcus had on the stand. An otherwise great image was undermined by mist, which kept rolling in off the sea. It was possible however to see that no sunspots were visible. Here’s hoping for a better 2019 Regatta. Folk Week proved to be a mixed bag, with the event on Saturday 18th falling foul of cloud; indeed conditions were very similar to the previous week at Regatta. 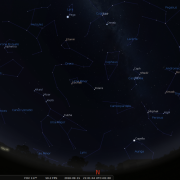 Tuesday evening turned out unexpectedly clear, and being mild an unscheduled star party proved rather successful, with the Moon, Mars and Saturn the mainstays of the evening. The images were surprisingly steady, and much appreciated by all. The event on Friday evening was disappointing in terms of public attendance – hardly any, probably due to the fact the temperature was a good 12 degrees centigrade cooler than on Tuesday, and the chill breeze didn’t help either. Keith, Lee and John braved the elements; Mark was late coming back from Malton, but eventually did make it. Elaine also made it down having been chilled to the bone on the moors. Although lasting little over an hour, our doggedness was rewarded with a shooting star (periodic) and some interesting moonlit heavy shower cloud formations passing down the North Sea, far out. An occasional lightning flash added to the scene. It was definitely a hot chocolate ‘bedtime drink’ once back home. Brrrr. Saturday 25th proved to be a popular event, the conditions being far calmer and a bit warmer than the previous evening. There were certainly a lot more public around, which all seemed to head in our direction once the (almost) full moon rose above the youth hostel across on the east side. The bait worked (as always) now to reel them in and keep their attention. 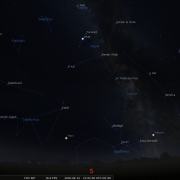 Did we mention Saturn and Mars? Yes, that did the trick, people amazed that you could see the rings of Saturn and its largest moon, Titan. Mars also proved popular, in spite of looking a little blurry, but not too bad. The Moon delighted many who had not viewed it through a scope before; the lunar rays emanating from the fresher craters being very prominent and pleasing to the eye. The event was a fine way to round off the busy late august events schedule. We won’t mention that Sunday’s star party was called off due to the cloud and rain...and wind...and chilly temperature. Ah well. Thanks to Andy, Keith, John, Lee, Phil, Elaine, Barbara and Mark for assisting with scopes, and helping out at the events. 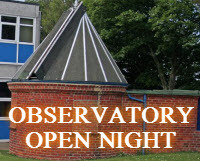 On Thursday 23rd conditions were again clear, however on this occasion the Bruce Observatory at the college served as our observing location. 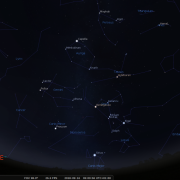 John, Keith and Mark ventured up to see how Jupiter, Saturn and Mars fared in the Cooke refractor. Proceedings were not as straight forward as hoped for. The first issue encountered was lack of light to see by, the electric to the observatory having been turned off within the college. Phone light and a wind-up torch had to suffice...oh and moon light. The next problem encountered was the refractor’s drive mechanism, which kept stopping. Luckily the illumination we had was enough for Keith to notice the drive box, which houses the governor balls and from which the pulley and weights are suspended, was out of alignment, suffering from a hefty knock we reckoned. Once re-aligned we were back in business, furthermore as we observed, the telescope speed control (which was also way off) was adjusted to a much better degree of accuracy allowing objects to stay centred longer in the eyepiece. As for actual observations, well Jupiter, was difficult to acquire being low down in a position awkward for the sitting of the steps (over the step well) but we persevered. The image was ok, but we have seen much better for this apparition. Saturn was rather more satisfactory, with the Cassini division clearly evident as too was Titan and tantalizing glimpses of another moon – perhaps Rhea. 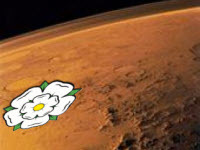 Mars was also not bad, considering its low altitude. Surface makings were evident, but the turbulent air certainly tested patience at the eyepiece. The gibbous Moon was a grand sight, with the bright crater Aristarchus catching the eye along with its near neighbour Herotodus, which is attached to the Vallis Schröteri and the sinuous rille system known as Rima Aristarchus. The night was rounded off by taking in Alberio; beta cygni – a glorious spectacle before finally ending observations with epsilon Lyra – the ‘double double’ in Lyra. All in all a good 90 minutes spent in the observatory. Sept 1st (tonight) will hopefully find many of us at Hook’s House farm Campsite, weather permitting. The event is due to commence at 20:00h, so we shall be travelling over around 19:40h. The site is just off the B1447 (RHS) on the way down into Robin Hood Bay. 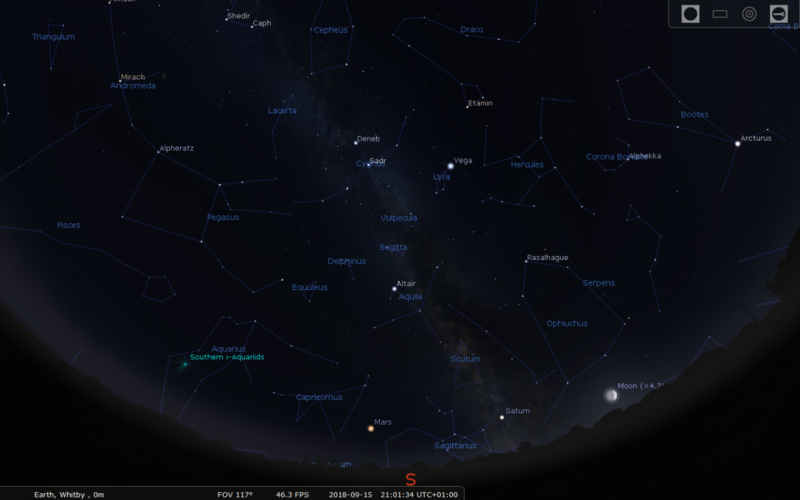 Jupiter, Saturn and Mars, will all be available and with a waning moon not rising until 22:30h, a lengthy deep sky observing window will be available. It promises to be a cracking evening. Transport may be required for equipment etc, Mark will be making contact. 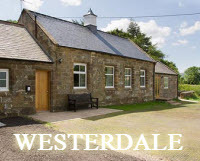 Our annual pilgrimage to Westerdale will take place on Friday Sept 14th. Setting off from Mark’s (Laburnum Grove) around 19:15h we anticipate to be at the village hall for 19:45h, allowing time to set up the telescopes should conditions allow. Plan B will be an indoor presentation, which last year was called into action, cloudy skies preventing any observation outdoors. I’m sure fellow member and Westerdale legend John Randles will be rounding up the locals for a warm welcome. Fingers crossed that skies will be clear this year. Next month Whitby Museum is hosting a landmark talk on astrobiology (hope you got the e-mail) Charles Cockell, Professor of Astrobiology at Edinburgh University, will be talking about his fascinating work on extra-terrestrial life. The event is free, but you have to book tickets online. Several members have already done so, but Mark has already block booked 8 tickets of which 4 are remaining. So if you would like to attend please let Mark know as soon as possible. The event starts at 19:00h, Tuesday 18 September, Whitby Museum, Pannett Park, Whitby, doors open 18:30h . 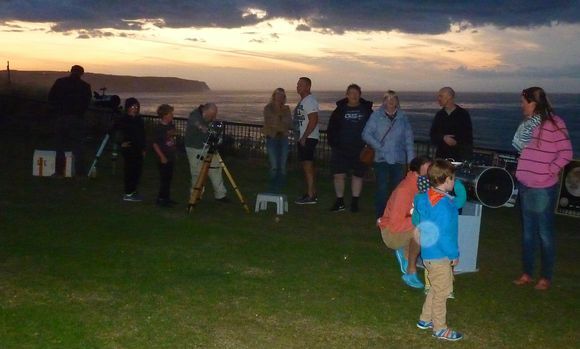 Although not until October, it looks as though we shall be main hosts for the half term ‘dark sky’ star party event to be held at the Danby Moors Centre. 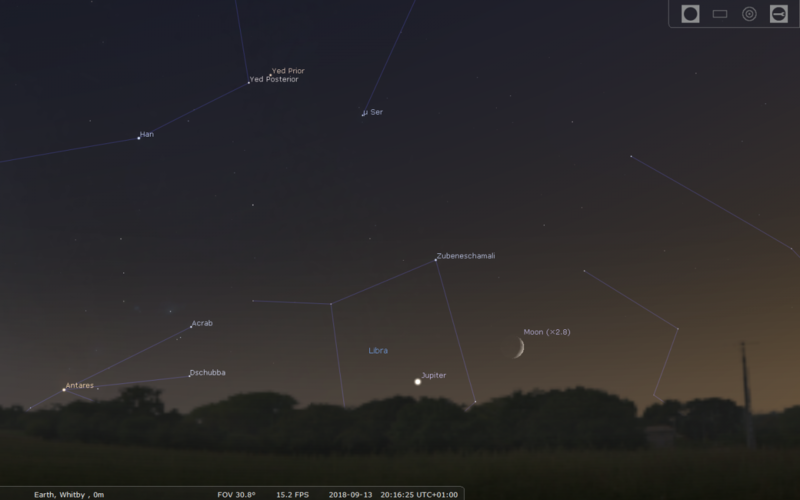 Unless anything crops up this will be Oct 27th with a start time of 18:30h, perhaps 19:00h. Full details will be given in the October notes. 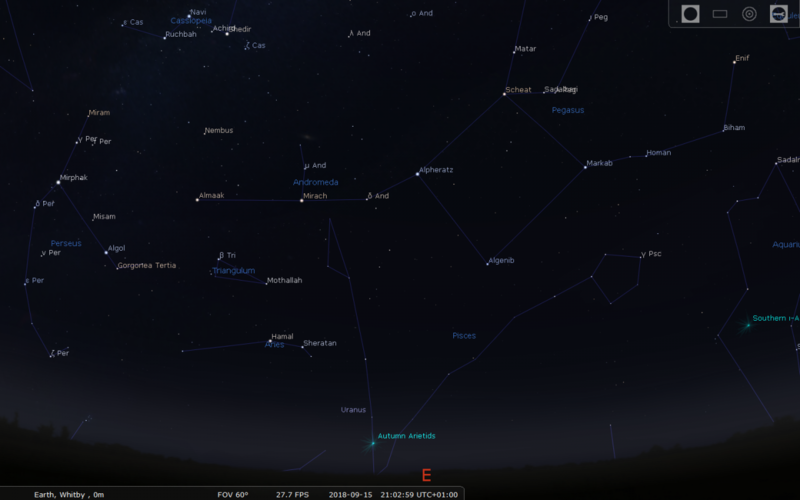 We can however say that the winter star night at the centre will be on March 2nd from 19:00h. 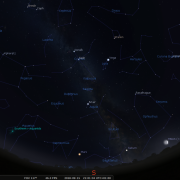 Again, the society will be hosting the star party and any indoor presentations. 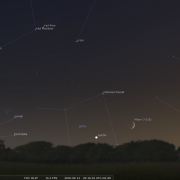 After several months dominating the Western twilight, Venus will finally be lost during the first week or so of September, setting by 20:00h. 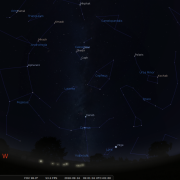 Look for a conspicuous ‘star’ very low to the NW horizon. 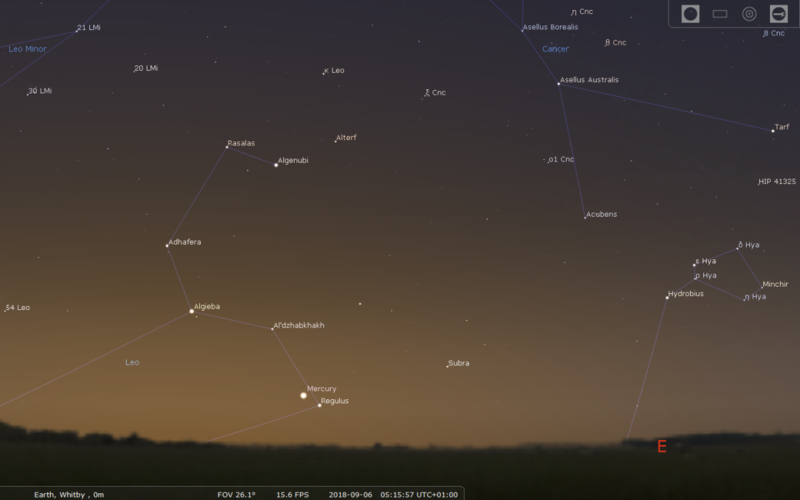 Jupiter is also nearing the end of its evening apparition, just about staying above the horizon all month, but becomes increasingly difficult to spot from midmonth, setting by 20:00h. 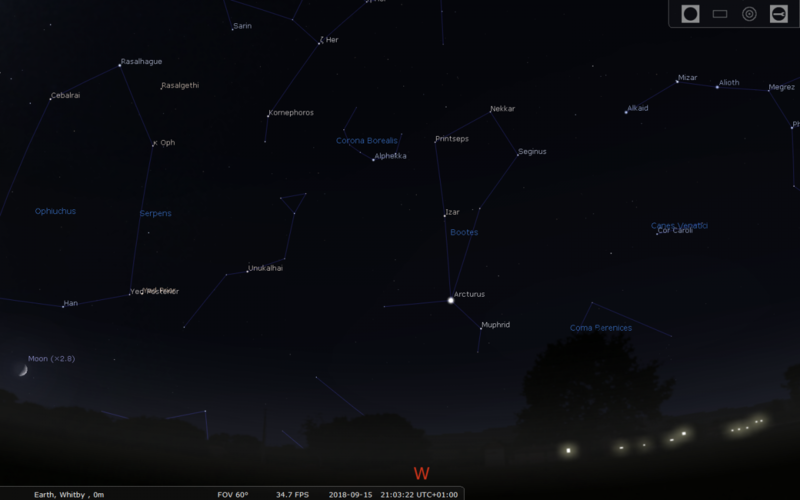 It will however still be worth observing for the first week or so, visible low in the SW twilight sky. 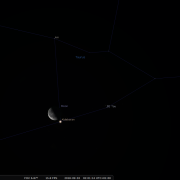 On the 13th a waxing crescent moon sits upper right. 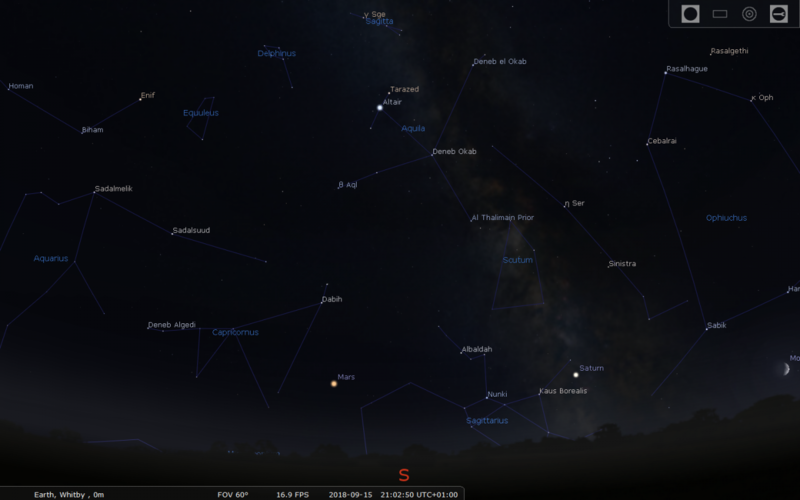 Saturn is now ideally placed for observation as twilight deepens, visible all month relatively low down above the S-SW horizon. The rings are visible in any modest scope, but an aperture of 4” or more is needed to clearly define the major ring ‘gaps’ such as the Cassini division. Above all steady seeing is required, that and patience at the eyepiece. 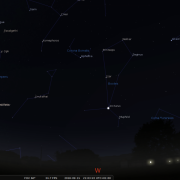 Look for Titan; Saturn’s largest moon, visible as a speck of light nearby the disk. Our moon lies very close by on 17th. 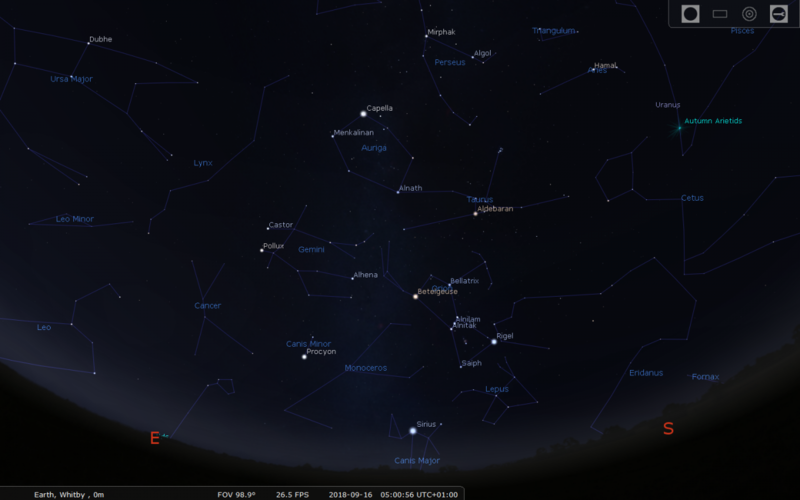 Mars resides centre stage low above the south horizon, a conspicuous fiery presence to the naked eye. It is a pity that for this opposition the red planet sits well below the ecliptic, which is itself always quite low during our summer evenings. Being so low we look at Mars through our dense, turbulent air, causing the image to ‘boil’ in the eyepiece; however those fleeting glimpses of the Martian surface are worth the wait. Look for the polar caps and some darker markings. 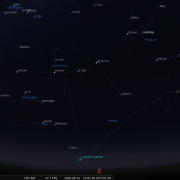 The moon resides above right on the 19th. 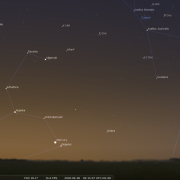 Finally, Mercury may be found in the dawn sky for the first 10 days of September, look for it just left of due east, within a ‘fist’ height of the horizon. On the 6th Mercury joins Regulus (mercury lies to the left ) Then on the 8th an extremely thin crescent moon lies upper right with Regulus in the middle and Mercury lower left. You will need to observe around 05:10-05:25h. 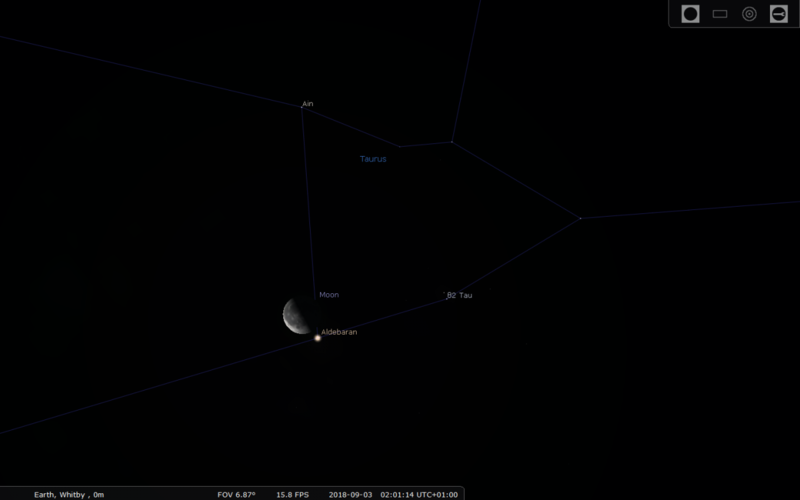 On the 3rd around 2am a waning crescent Moon passes fractionally above Aldebaran in Taurus. 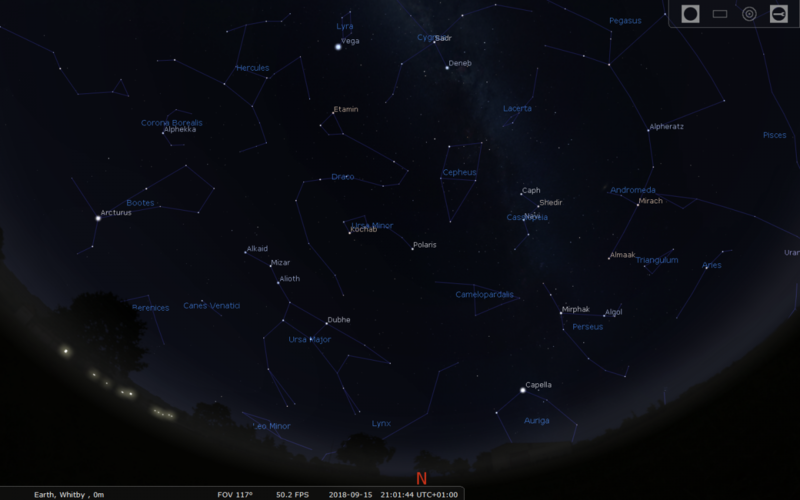 There are no major noteworthy meteor showers in September; however you may spot a few Piscids which have two peaks: the 8th and the 21st. Rates are low, only 6 or 7 per hour at best, barely more than sporadic levels. 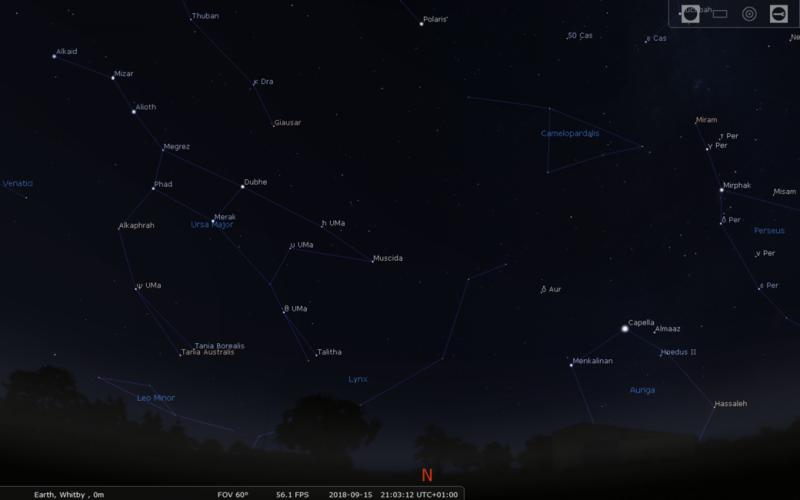 As with all meteor showers early morning viewing will be best. According to astronomical convention autumn officially commences in the northern hemisphere around September 21st the date of the Autumnal Equinox. This year however autumn is a little late with the ‘equinox’ not occurring until September 23rd when Earth finally arrives at ‘third base’ on its journey around the Sun. For the second time in the year neither northern nor southern hemispheres are inclined toward the Sun, and across the planet hours of daylight and darkness are equal. From our perspective the Sun re-crosses the celestial equator and with each passing day arcs lower in the sky as our hemisphere tilts away from the Sun. 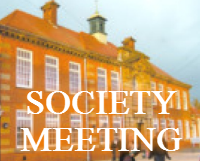 The eighth society meeting of the season, in newly renamed Caedmon College Normanby Site (you may know it as Whitby College or Whitby School), Room H1.